To identify the specific features of the kinetics of oxidation of polymer mixtures, determine the key structural elements, and create a model that can describe the mechanism of thermal oxidation of polymer mixtures, it is necessary to determine the relation between the initial structure of a polymer mixture, structural rearrangements associated with oxidation and the kinetics of the process. The aim of this book is to elucidate the complicated problem concerning the connection between the structure and mechanism of oxidation of heterogeneous and heterophase polymer systems. The material presented in this book concerns the specific features of the kinetics of oxidation and those of the structure of polymer systems. 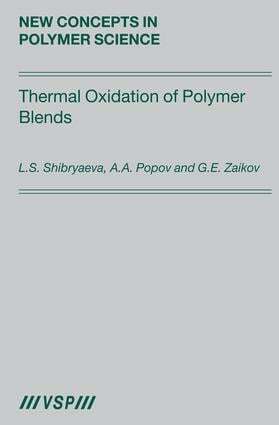 The book deals with an analysis of the key factors that can affect principally the mechanism of thermal oxidation of polymer mixtures, determines the role of the phase morphology, structure of components, and the interface layer (or boundary) in the kinetics of oxidation of heterophase system by an example of mixtures of polyolefines. Along with the kinetics of oxidation of heterophase systems, problems of investigation of their structural parameters in the oxidized state are considered. With this aim, the material presented in the book concerns not only the mechanism of oxidation of polymer mixtures but also homopolymers of diverse morphology and model systems.